I have been a patient of Dr Shifrin’s for over 5 years and I can’t say enough great things about her office. Dr Shifrin is very knowledgeable and explains everything thoroughly. She does not rush and talks TO you, not AT you. The staff is friendly and now they are doing new patient tours and giving a welcome gift! I have always hated going to the dentist, but not this time. These wonderful ladies took great care of me, and I will definitely be back. I had an emergency appointment and Dr. Shifrin stayed later to fix my problem. Any other dentist would have tried to schedule next day. She continually asked if I was comfortable or if I was having any pain. Everyone there was friendly, and there is a great atmosphere. I strongly recommend this place. Dr. Shifrin and her staff are simply the best. She has been my dentist for years and I have received excellent customer service and patient care since day one. I would recommend her to anyone looking for a dentist who takes the time to talk with you and address your concerns. Always top notch! Amazing staff, very friendly! I needed a new dentist when I moved to Atlanta this past year and I am beyond thankful to have found her practice. Dr. Shifrin is very knowledgable, skilled at what she does and genuinely cares for her patients. Best dentist I’ve ever had and I would highly recommend her to everyone! We proudly serve residents of Duluth, Johns Creek, Lawrenceville, Lilburn, Norcross, Suwanee, and nearby areas. 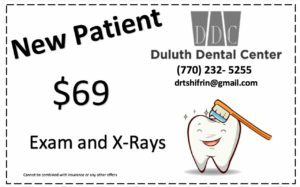 Dr. Tatiana Shifrin, DMD, started Duluth Dental Center in 1997 a few miles north of where she grew up. We are a locally-owned, family-oriented dental practice. Our team is dedicated to serving the dental needs of our local community. Dr. Shifrin is a graduate of the Georgia Institute of Technology and is Ivy-League trained. She received her dental degree from the University of Pennsylvania. Upon receiving her degree, Dr. Shifrin served as a Captain at Andrews Air Force Base, providing dental care to the brave men and women of the United States Air Force. After her military service, Dr. Shifrin established Duluth Dental Center to serve the dental needs of the community in which she grew up. We would be proud to offer high-quality dental care to you and your family. To learn more about the comprehensive services we offer, explore our website or give us a call today. We hope to become your dental office of choice for any oral health need. 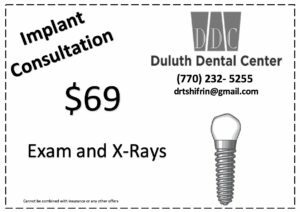 To schedule a visit, contact Duluth Dental Center today.